Last June, tech-training expert Pluralsight moved in to a shiny new headquarters in Farmington, Utah. There are no individual offices, no cubicles, and there’s definitely no lack of creativity in the 30,000 square foot space. Instead, creative agency Roundhouse—with assists from DDG and ae urbia—designed an open floor plan of collaborative spaces and unique details (ahem, candy wall) for the developer-training platform. We reached out to the team at Roundhouse for more scoop. This graphic mural greets employees and visitors at the entrance of Pluralsight’s new HQ. Image courtesy of Roundhouse. How is the brand reflected in the space? Working with DDG Contstruction and the architects and engineers at ae urbia, we translated Pluralsight’s core values of “working, playing and winning together” to the interior. Thus, there are no individual offices in the 30,000 square-foot space. Instead, a mix of open and private collaboration areas provide living room-esque settings, pod-like booths lend some privacy, and glassed-in conference rooms impart that yes, this is a business—but a forward-thinking one. Shelves stacked with candy—sign us up! Image courtesy of Roundhouse. An abundance of natural light opens up the office even more, while a lively modernist motif gives it a relaxed feeling. Numerous design accents, including an infographic wall, classic candy-filled shelves, and an air-plant installation underscore a welcoming vibe. The result: an office space unlike anything suburban Salt Lake City has seen, reflecting Pluralsight’s leadership in the education and technology revolution. Designers combined a mix of open and private collaboration areas to provide living room-esque settings, pod-like booths for privacy, and glassed-in conference rooms impart that yes, this is a business—but a forward-thinking one. Image courtesy of Roundhouse. What is the most unique feature about the new space? Its floor plan, which is open yet allows for private collaboration, all within a relaxed and beautiful setting. What is the proximity to public transportation and other amenities? The FrontRunner train station is right across the parking lot—just a few minute walk from the Pluralsight HQ. This provides direct train access to the airport, downtown Salt Lake City, and both the north and south suburbs. Dozens of Pluralsight employees ride the train every day. What is the square footage per person? Capacity is 170 seats, with 175 square feet per person. What were the construction/hard costs per square foot? A rec area in the new space. The company’s core values include “working, playing, and winning” together. Image courtesy of Roundhouse. Which furniture brands and/or dealers did you use? CCG Howells, Haworth (workstations, glass wall system), Davis Furniture, HighTower, and a number of other specialty furniture brands, as well as several custom pieces from Call Design, Wavell-Huber, and a few other local artisans. How many total employees are there and what’s the daily population? There are 130 full time, daily employees. Is there a mobile work or work-from-home policy or are most of the employees there all day every day? Most Pluralsight employees come into the office every day, but they can work from home, as well. There’s also a satellite office 40 miles south, at the south end of the Valley for employees who are in that area. It’s up to employees to set their own schedule and work hours; Pluralsight very flexible to accommodate family needs. A casual, living room-esque meeting space. Image courtesy of Roundhouse. What was the hardest aspect of change for people in moving from the former space? 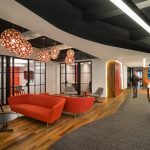 “We thought it would be the smaller workstations, but, thanks to the office’s open design and versatile workspaces, they have worked out really well,” says Steve Woolley, Pluralsight’s director of marketing. Please talk about any other notable aspects of the project that make it unique. Roundhouse originally partnered with Pluralisight as their creative agency, tasked with traditional creative work, from branding work to advertising campaigns. On a visit to Roundhouse’s Portland, Ore. headquarters, the Pluralsight team liked the office so much that they wanted Roundhouse to design their own HQ. Though this was the first time Roundhouse designed an office space (apart from its own), its retail space design experience with adidas and high design, mood-setting mentality made the jump seamless. "Dry Jacuzzis" and a bunch of cuckoo clocks, too. Intrigued?